Venture til to af Amalfi-kystens mest efterspurgte destinationer, og tag i seværdighederne fra vandkanten på denne fulde dags bådtur fra Sorrento. Efter afhentning fra dit hotel, overfør til havnen og klat ombord. Se den kolde Sorrentokystens hårde skønhed, før du fortsætter til UNESCOs Amalfikysten. Gå afsted i Amalfi og udforske byen på en vandretur (ekstra omkostning), før du fortsætter til Positano, hvor du har flere timer at shoppe, svømme, slappe af på stranden og meget mere. Very relaxing tour. I'm not sure if it was the microphone, loud engine noise or just her accent but we hard a hard time hearing/understanding what our tour guise was saying. That being said, still a nice boat tour with 2 island stops. We thoroughly enjoyed our day on the boat seeing the most beautiful area of Italy. 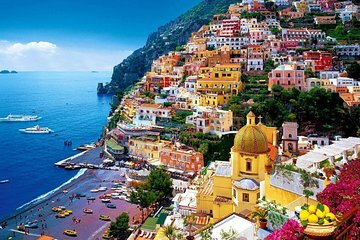 They gave you plenty of time to explore Amalfi and Positano. Only reason I didn't give them a 5 rating is because the boat was too crowded. This is the tour to book to see the Amalfi coast by boat. Apart from the issue of not knowing my pick up point as I was renting an apartment, I had to call a few times before thankfully the operator messaged back. From then on, it was all good! I was worried about motion sickness so thought of choosing this tour by boat to visit the Amalfi coast with my 7 year old daughter. It worked out great - you get to Nerano by coach and then board a decent sized boat with the tour group. The boat was comfortable, and had a clean toilet! We saw so many points of interest, grottos and the stunning coastline before docking at Amalfi first. We had 2 hours to explore on our own there, which was plenty in my view. After that there was the optional visit to the Emerald Cove 5 Euros, which was so worth it. We didn't end up going to the Blue grotto but the pictures seemed much the same so I am glad we had this option on our way to Positano. Again, we had enough time to explore there before heading back to Nerano, which is a lovely little town as well. We then waited for a bit to get the right coach back to Sorrento, but after the lovely day out, it was just a minor wait. Definitely worth the expense and the best way to see the stunning Amalfi coast! We had an awesome time seeing the Amalfi Coast by sea. We were picked up by a bus a taken from Sorrento to Nerano. The boat itself was nice. There were places to sit under cover as well as in the open so you can choose. You can take photos since there were no windows. After Positano and Amalfi, we got the chance to go into the green emerald cave grotto for only another 5 euros. This tour was the highlight of our vacation. Finally, you are given plenty of time to explore Positano and Amalfi. Having gone to the Amalfi Coast before by van and by bus, there is no doubt that going by boat was the best way to go. Would of been better getting the ferry from sorrento it was not a tour we were picked up at 7.45 taken to the boat that was old and over crowded and left at Amalfi and Position without a guide. Fortunately we had been before so we knew what we wanted to do. With decent amount of time in both amalfi and Positano it was a good intro to the coast. It was kind of hard to hear your guide from where we sat towards the back but overall def worth it. This tour was great. I believe it is the best way to see the Amalfi Coast. The boat captain did a great job of going to all the local spots of interest and making sure all sides of the boat could see. Maria was our guide and was great. Enough time at each town to see and enjoy. Highly recommend. The only negative is the little bit of a drive from Sorrento to get to the port, but the tour was worth it. We loved it.